The Blazers were out looking for revenge on Thursday. After falling to Montevallo on Jan. 24, the Blazers evened the score, winning an intense 75-70 battle. Guard Beau Justice led the Blazers in scoring, posting 19 points and knocking down four three-pointers. Justice caught his stride after going into halftime with only three points on the board on 1-4 shooting. The Blazers are currently third in the Gulf South Conference but will be looking to level up. They have seven conference games left, including one against each of the top two teams: West Alabama and Delta State. The 75-70 score was way more convincing than it looks. The Blazers seemed to have control of the game all night, only featuring two ties and scoring changes. They even led by 14 at one point in the second half. We saw a different side of the Blazers in their second matchup with Montevallo. Since beginning the season 9-0, the Blazers have been 7-5. They have a sense of urgency as they head into the home stretch of season. The Blazers adopted a new style of play Thursday, getting away from their run-and-gun style and displaying urgency on the court. Players were diving for loose balls, playing tight defense and putting it all on the line for them to come away with a victory. A team who usually prides themselves on pace and space, the Blazers slowed their fast-paced offense down. Players took their time to find good shots and turn those shots into great shots, sharing the ball and assisting 17 out of 27 field goals. This is a pivotal time to utilize this type of play, as the game will begin to slow down in the postseason. With conference games that will determine seeding, the Blazers are showing signs of life with their nuances of styles to play. 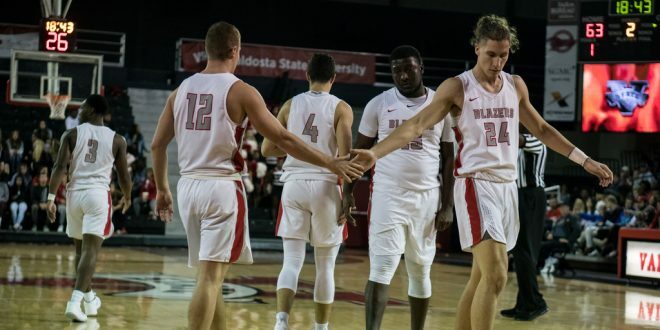 The Blazers have a week-long break before heading off to Carrollton and facing University West Georgia on February 7.